The new Bb LABORATORIES Silky Veil Pact UV is light in texture, silky in touch for a sheer coverage that instantly gives the skin a flawless glowing finish. The two major skin care ingredients - "Placenta Extract" and "Hyalurone Elastin Collagen Extract" are fused to the powder particles, which can activate cells and inhibit the formation of melanin. Combined with squalene, it exerts a long lasting moisturizing and water retention function. The antioxidant properties in vitamin C can lighten the skin tone, reduce blemishes, regulate sebum secretion and stimulate collagen formation. Dipotassium glycyrrhizate is a skin conditioning agent with anti-allergic and anti-inflammatory properties. The product contains micro-particles of physical sunscreen component titanium dioxide, without using irritating UV absorbers. 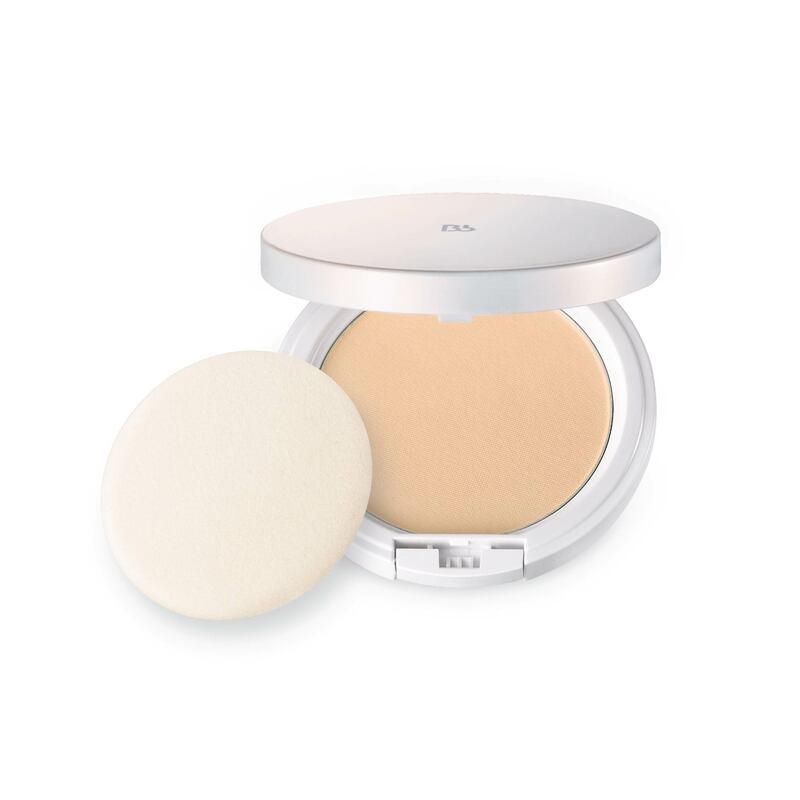 With a UV protection of SPF15 PA++, the pressed powder helps block UV rays and prevent photo-aging. The smooth powder blends effortlessly to the skin, fits all shades of skin tones, creating a "soft-focus" effect to conceal fine lines and imperfections. It sets makeup flawlessly throughout the day, creating a bright and natural look. Blocks UV rays and prevents photo-aging. For setting makeup or touching up, gently apply the powder onto the skin with the press puff attached. The Placenta White UV contains a variety of beauty ingredients which protect the skin agianst UV rays, and repair damaged cells. Placenta extract can vitalize cells and prevent the formation of melanin. Hyaluronic acid is good at moisture retention, while yeast extract and mulberry extract can increase skin brightness. Aloe extreact promotes cell repair and soothes the skin. Without irritating UV absorbing agents, Placenta White UV gives the skin with mild but highly effective UV protection. which is a prefect base to keep the makeup long lasting. After all skincare steps, gently apply appropriate amount over the face. Follow with makeup. Use every day in the morning. Re-apply after 4-6 hours. 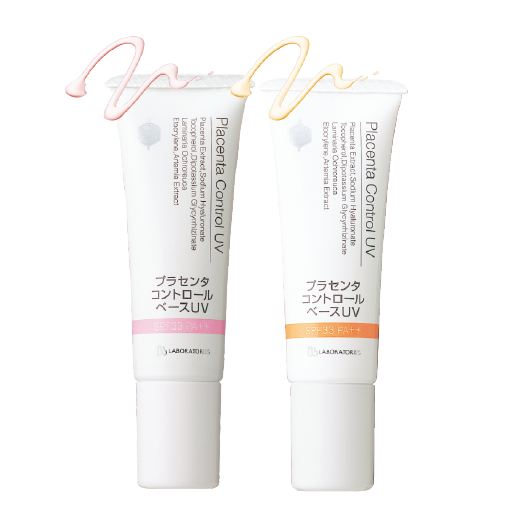 The Placenta Control UV can hide blemishes to achieve a flawless complexion. Placenta extract can vitalize cells, prevent the formation of melanin and promote depigmentation. Hyaluronic acid is good at moisture retention. Laminaria ochroleuca extract, ectoine, artemia extract and vitamin E are highly effective antioxidants, which promote cell metabolism rate and regeneration. Without irritating UV absorbing agents, Placenta Control UV can conceal wrinkles, pores and uneven skin tone, keeping the makeup long lasting for a glow and flawless skin. Available in beige and natural pink color. After all skincare steps, gently apply appropriate amount over entire face. Follow with makeup. 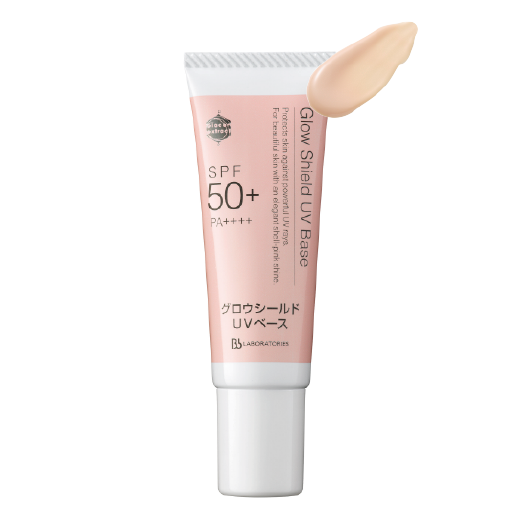 Glow Shield UV Base has upgraded its UVA & UVB superior protection to SPF50+ and PA++++. Contains physical UV blocking agents zinc oxide and titanium dioxide, without using irritating UV absorbing agents, which can prevent your skin being damaged by sunlight and aging. 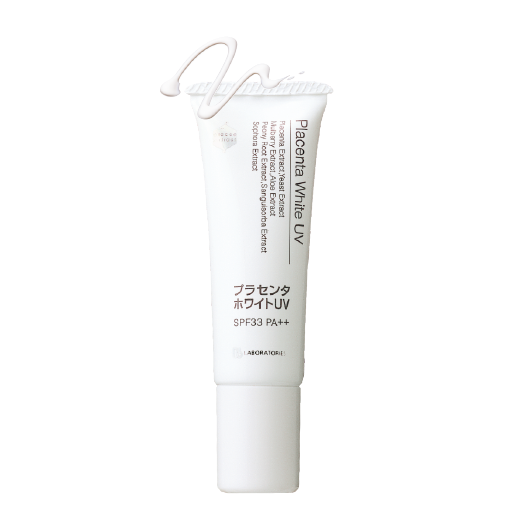 This UV base contains placenta extract, collagen and Chinese herbaceous peony extract, etc, which can moisturize and smooth the skin by balancing the hormones and resist to sweat and sebum. The shell pink color adds to the translucency and brightness of your skin for a healthy complexion and a soft, feminine radiance, giving you the best foundation of an airy flawless makeup. After all skincare steps, gently apply an appropriate amount over the face. Follow with makeup. Use every day in the morning. Re-apply after 6-8 hours. 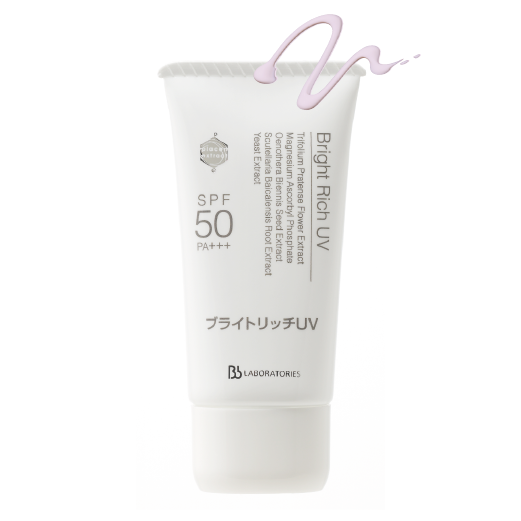 This UV cream shields your skin from UV rays - the main cause of photo-aging - with superior protection from UVA and UVB rays (SPF50 PA+++). It is suitable for those having outdoor activities or those who are looking for high UV protection. This highly emollient cream contains extracts of oenothera biennis seed, scutellaria baicalensis root and red clover flower, which moisturizes and smoothes the skin by balancing the hormones in the skin. It resists to sweat and sebum, creating a perfect canvas for applying foundation. The light lavender color adds to the translucency and brightness of your skin for a healthy complexion and a soft, feminine radiance. The powder contains squalene, hyaluronic acid and royal jelly, which hydrates the skin and retains moisture. It also helps control oil and shine, leaving the makeup stays fresh for hours. The honey powder can intimately settle on the skin, which effectively conceals pores and fine lines. The perfect combination of a special moist formula and powder granule keeps your skin glow and flawless. After applying foundation, gently apply the powder over the face with the press puff attached. Use every day in the morning. 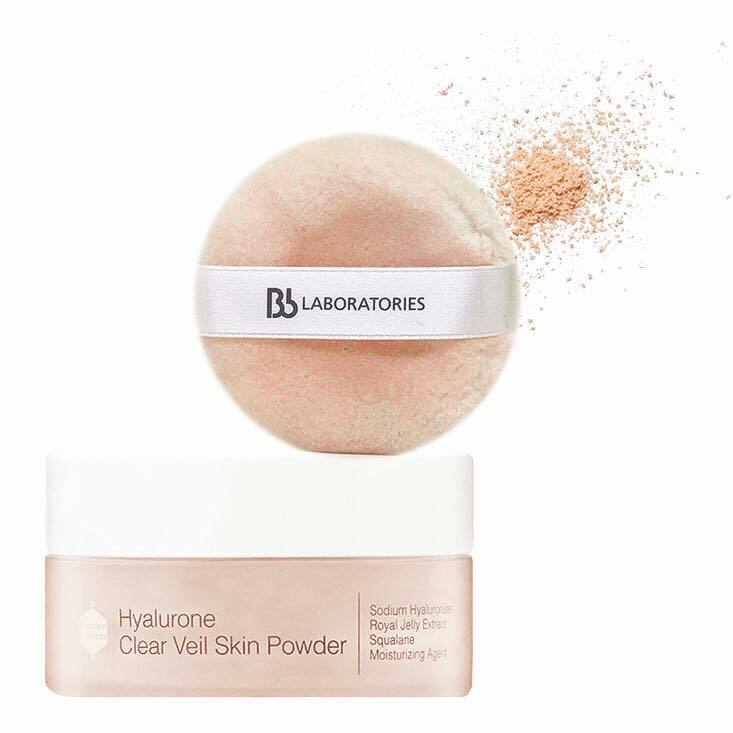 *Limited promotion of Hyalurone Clear Veil Skin Powder Set, >>CLICK TO SHOP<<.